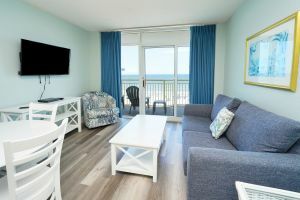 Bay Watch Resort is an iconic landmark in North Myrtle Beach, South Carolina with its three high-rise towers, three oceanfront pool decks and central location to everything you could possibly want to do during your family beach vacation. 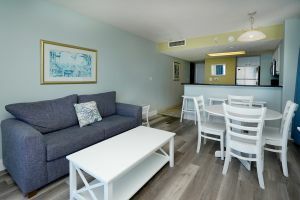 Bay Watch III 532 is a two bedroom, two bath oceanfront condominium. 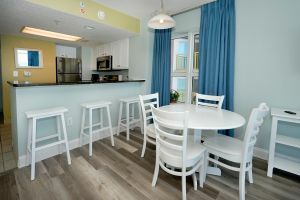 There is plenty of space throughout this oceanfront condominium and you will love making this your home away from home for a North Myrtle Beach vacation. There are conveniences galore in this vacation rental, such as WIFI, washing machine, clothes dryer and a kitchen. Take it easy indoors and out when you vacation at Bay Watch III 532. The three swimming pool decks will occupy so much of your time as the hot tubs, kiddie pool, lazy river and swimming pools lure you outside. Take a dip in the pool outside before exploring all the swimming options inside. Do not forget the Atlantic Ocean is but steps away from your lounge chair at Bay Watch Resort. A fishing pier, numerous golf courses and delicious seafood restaurants are close to the Bay Watch Resort and family amusements, water sports, marinas with boat rentals, live entertainment theatres and more are only minutes away from your oceanfront condo. Departure maid service is required.